The only instance that the "leishev basukka" blessing may be recited according to all opinions is prior to eating a meal which includes bread. When beginning a meal, the leishev basukka blessing is recited immediately following the hamotzi blessing, even before one begins to eat the bread. Similarly, common custom is to recite the leishev basukka blessing in a sukka when eating a snack made of grain products such as cake and cookies, as well. According to the Talmud one should actually recite the leishev basukka blessing each and every time one enters a sukka. Indeed, many halachic authorities in the past have ruled that this is the way we are to conduct ourselves. The prevalent practice, however, is not like this view. Most contemporary halachic authorities insist that the leishev basukka blessing be reserved exclusively for meal time in the sukka. Click here for moreThe decision to reserve the leishev basukka blessing exclusively for eating was made because it is generally eating which makes up one's primary use of the sukka. Additionally, the sages wanted to ensure that the blessing would only be recited when benefiting from the sukka in a significant manner and not when entering merely to fetch something, or the like. Nevertheless, in deference to the view that we should be reciting the blessing upon any visit to the sukka, it is best to arrange that there will be a food upon which to recite the leishev basukka blessing even when truly intending to use the sukka for other purposes. It is interesting to note that in the event that one used one's sukka for sleeping, studying or other similar activities (in which case a blessing would not have been recited) – the leishev basukka blessing recited when one eventually eats will retroactively cover those earlier activities as well! When visiting a friend's sukka, however, the halacha may be slightly different. When one visits a friend's sukka and intends to spend a considerable amount of time there, the leishev basukka blessing may be recited even if no food is served. Even so, it is preferable to try and eat something there in order to justify the blessing according to all views. Indeed, if for whatever reason one has no intention of eating all day, the blessing leishev basukka may even be recited upon entering one's own sukka when intending to remain there for a considerable amount of time. Any time one recites a leishev basukka one should have in mind that the blessing extend to all other activities one may engage in throughout the course of the day, such as sitting with friends or sleeping. If one forgot to recite the leishev basukka before beginning one's meal it may be recited any time one remembers. It may even be recited after one has finished eating as long as one intends to spend some additional time in the sukka. One who does not leave the sukka between meals does not recite a new leishev basukka when beginning his next meal. There is a dispute among the halachic authorities whether the leishev basukka blessing is to be recited as part of havdala. Some authorities consider the drinking of havdala wine to be a transitory act unworthy of the blessing while others argue that since the wine is being drunk in conjunction with a mitzva then the leishev basukka should be said. My next post will be the Tuesday after Sukkot (Oct. 13). 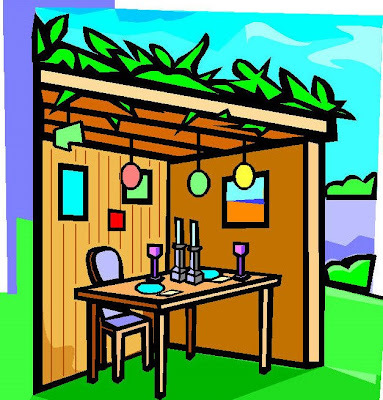 I wish everyone a true "vesamachta bechagecha" over Sukkot! !